Down the Rate Sheet as a PDF. The rates below are for individual treatments. We also offer package pricing and memberships or “Wellness Passes” to Isthmus Wellness. Click here for details about our various Wellness Passes or inquire at your next appointment. 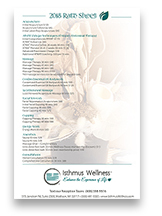 Isthmus Wellness offers package pricing to help you save on your ongoing wellness plan. Click here to view the package pricing. Isthmus Wellness offers monthly specials. Click here to view the current special offers. Additional ATMAT Coaching: $30 per 15 min. *All massage services can be adjusted for prenatal care. If a client cancels on the same day (within 24 hours is the standard), Isthmus Wellness will charge a same-day cancellation fee of $50. If a client needs to cancel due to an emergency, they will need to speak with the manager of Isthmus Wellness, Chandon Williams, regarding a decision on whether or not cancellation fees will be waived. Please do your best to keep your appointments at Isthmus Wellness. If you do need to cancel, please do so in advance so that you avoid any cancellation fees. Isthmus Wellness can be reached at 608-441-9355. You may also send an email via our online contact form.